Last week I shared 25 retail titles that proved without a shadow of a doubt why the Wii U, despite its weak sales, very much deserves to be owned by any self-respecting gamer. This follow-up piece details 25 downloadable pieces of software off the Wii U eShop that further illustrates why Wii U owners certainly have a lot to play on their systems. From action-platformers to Metroidvanias, puzzle games to shooters, this list of 25 (and many more honorable mentions that couldn't fit in this article) has some very good titles. Again, since this is article is image-intensive, please check it out after the break. Ratchet & Clank's remake on the PlayStation 4 launched a couple of weeks ago. While SuperPhillip Central can't cover that game just yet, the site can take a look at a game in the series that is quite underrated. It's Secret Agent Clank, and he's got the bad guys' number, for sure. 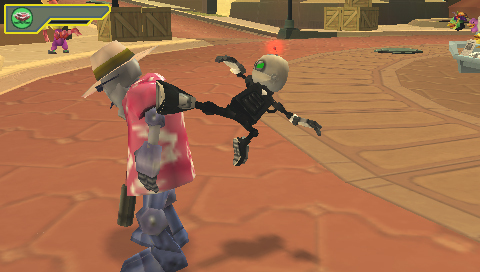 When he's not essentially Ratchet's talking backpack, Clank moonlights as a secret agent. Seriously. He's got the tuxedo to prove it, too. When his friend seemingly steals the most valuable gem in the galaxy from a museum and gets placed in jail for it, Clank feels something is awry. Thus, he goes on a mission to clear his good buddy and find the real culprit behind the crime. What you get with Secret Agent Clank is the same trademark humor, wit, and hilarity of the series in well done cutscenes and story sequences. Many familiar characters make their return in the game, and overall, the story had me smiling and engaged from beginning to end. 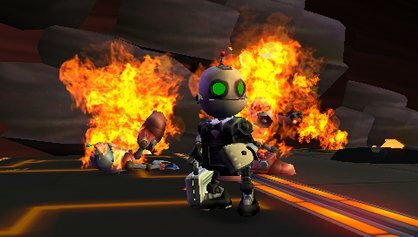 Clank, your mission-- should you choose to accept it-- is to save your buddy Ratchet and clear his name. The game name may be Secret Agent Clank, but Clank himself shares the spotlight with numerous characters. 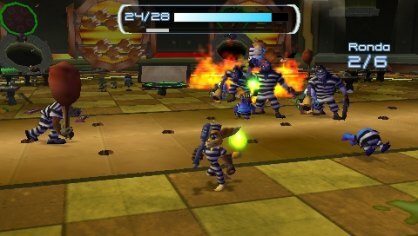 For one, there are Ratchet & Clank: Up Your Arsenal-style arena battles as Ratchet as he goes through hard times in the slammer. However, I found most of these portions of the game highly repetitive, even with some creative objectives like trying to keep Ratchet's towel on him during a shower battle sequence. Then, there are multiple outings as Captain Qwark who is having a biography written about him. 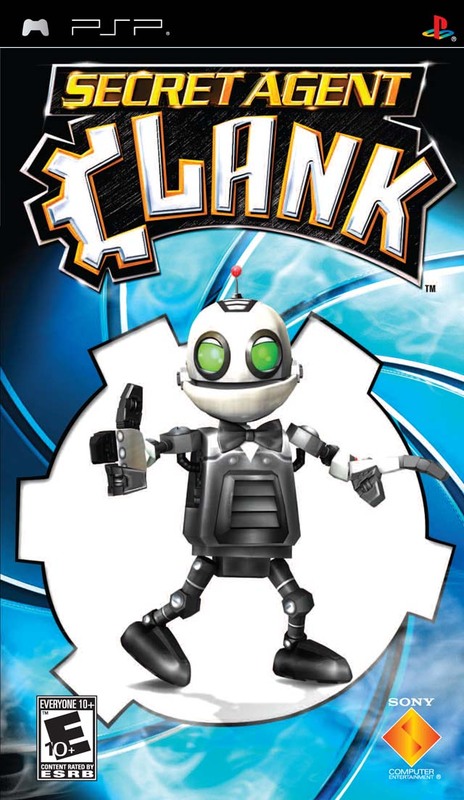 Of course, true to the Qwark name, Qwark's tales of his heroics are highly fictional, taking credit for things that Secret Agent Clank had done. They say you want to stand up to the toughest guy in prison. Ratchet seems to be that guy/lombax. Finally, there are the faithful helpers to Clank when our robotic spy needs some inside help, the Gadgebots. There are a trio of helper robots that follow one another, solving environment puzzles, hitting switches to move platforms in position, and interacting with various devices to make progress. 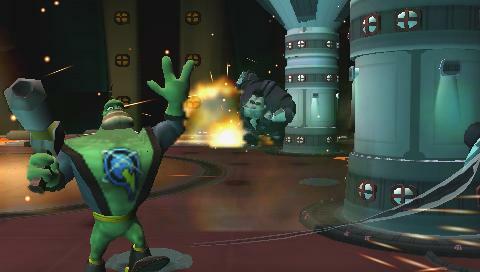 Captain Qwark is as wacky as ever in Secret Agent Clank. Secret Agent Clank's gameplay sections offer lots of variety, too. When Clank isn't stealthily making his way past guards, using sneak attacks to take enemies down with their back to him (a randomized four button press done just in time will take them out; else Clank will notify the enemy of his presence), and navigating through laser fields, he can be seen snowboarding, driving a vehicle down a sluice, solving Tetris-like lock-picking puzzles, and engaging in rhythm mini-games. Sneak behind an enemy, and they won't know what hit them! There is a lot of gameplay styles in Secret Agent Clank, and while this does keep the experience fresh, some of it simply feels like filler content to lengthen the game. I would have personally liked to see more of the traditional Secret Agent Clank gameplay: moving through levels, participating in enjoyable platforming, dishing out damage in combat, and things of that ilk. 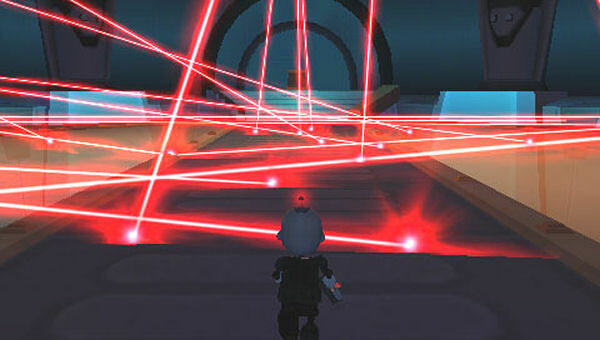 These parts of Secret Agent Clank were the most entertaining for me, as the while the stealth gameplay is rather basic, when done right, it's the difference between smoothly taking down foes and alerting an entire room to your presence, thus resulting in a precarious firefight situation. Both Clank and Ratchet have an arsenal of tools and weapons they can use in their sections that level up upon continued use. As a weapon levels up, it gains more power and strength to take down gobs of enemies. Ratchet's repertoire of weapons is mostly made up of callbacks to past games in the series, but there are plenty of new goodies to take down foes as well. Meanwhile, Clank's library of weaponry is all in the form of spy gadgets, whether bow ties that serve as sharp, killer boomerangs or cuff links that act as powerful bombs. 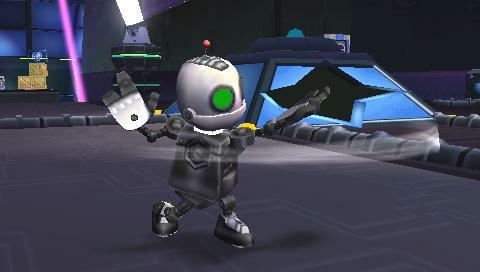 There are a plethora of non-weapon gadgets Clank uses as well, such as a pen that can blackout points where lasers project out of them, jet boots that allow Clank to double jump and glide across large gaps, and a monocle that when an enemy has been scanned, Clank can become a hologram image of that foe, perfect for slipping past defenses. The Tie-A-Rang is not only perfect for taking out faraway foes, but it's also mighty fashionable. I was worried how Secret Agent Clank would control with the lack of two analog sticks, or in the PSP's case, nubs, to utilize. However, the game handles rather well considering the input limitations of the hardware. You use the nub to control Clank usually, but you can also use the d-pad to strafe, excellent for maneuvering around foes and their fire without taking much in the way of damage. The shoulder buttons, normally used for camera controls, can be used in combination with the d-pad to always keep foes directly in Clank's sights. The Quick Select menu is easily accessed with a hold of the Triangle button, granting a safe way to swiftly switch between Clank's various weapons and gadgets. Like typical Ratchet & Clank adventures, upon beating the 6-8 hour campaign, you have the option of replaying through the story with all of your current weapons, maximum health, and more. The difference here is that enemies deal more damage and have more health. 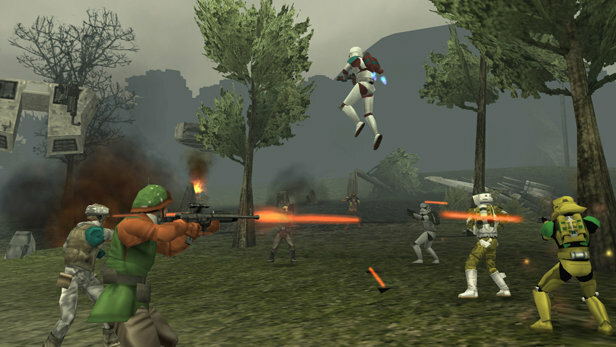 However, at the same time you earn more bolts for use to purchase new, more powerful weapons. Clank can use the Blackout Pen to blot out some of these lasers. Alongside the Challenge Mode, there are myriad skill points to earn, received by completing certain tough in-game tasks like getting through a portion of a level undetected, as well as Titanium Bolts to collect that are generally placed in well hidden locations. Earning skill points unlocks new cheats to use in-game while collecting Titanium Bolts unlocks new skins for Clank, Ratchet, and Captain Qwark. If you're familiar with Ratchet & Clank: Size Matters, then you probably know what to expect visual-wise for Secret Agent Clank. Like Size Matters, Secret Agent Clank puts the limited power of the PSP hardware to good use, offering nice looking geometry, a good frame-rate, nice character models, and an excellent field of view. 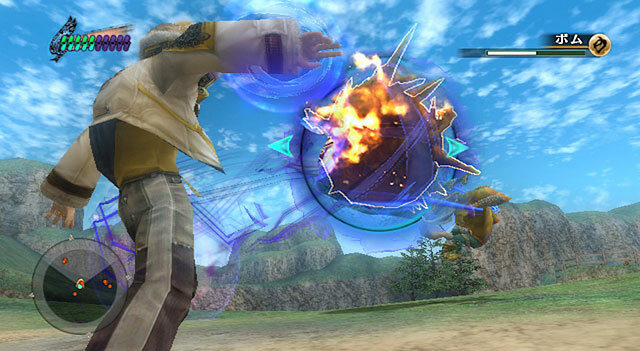 The sound effects, especially for using the high powered weaponry of the game, gives every shot that added sense of impact. The voice work is as excellent as ever in Secret Agent Clank, and the music is very spy-like, offering jazzy riffs, high octane beats, and catchy rhythms. Secret Agent Clank is overall a capable spin-off title that gives Clank the starring role he may or may not have been waiting for. Though the game offers a robust amount of gameplay types, not all of these have the same amount of entertainment as the main, most fun Clank platforming sections. If you're looking for a bite-sized adventure that plays to the strengths of the PSP hardware, then Secret Agent Clank should be your next mission. There's nothing worse as a gamer than following the development of a game you're so excited about, then all of a sudden the developer/publisher announces that the project has been put on hold, or worse, cancelled. Okay, maybe losing your save files to a corrupt memory card back in the day is worse, but work with me here. Anyway, the feeling of utter disappointment is immense. Like with part one, part two, and part three of this continuing series, these cancelled games that were once hyped, whether by many gamers or a select few, still manage to make those that were following them wince. 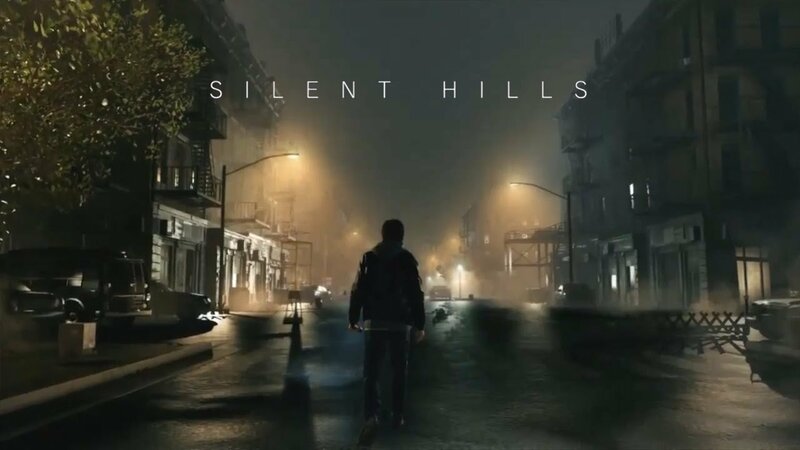 A dream team of Metal Gear's Hideo Kojima and famed Hollywood director Guillermo del Toro was behind Silent Hills, a psychological thriller of a horror title that saw an amazing, exciting, and downright scary demo, P.T., for PlayStation 4 owners. However, after Kojima's tumultuous departure from Konami, the developer opted not to continue the game's development, though it said it remained dedicated to the franchise. This was a tremendous blow to many Silent Hill and horror game fans, as the demo had brought such hype and excitement. The announcement of the cancellation of this promising project was like a blow to the gut, taking the wind out of many fans' sails. Eight Days was a game being developed by Sony's SCE London Studio and was set across the eponymous eight days. Not only that but it was intended to be set across eight different states. The choice of two characters would have been offered, one good and one bad, and the two would eventually cross paths and work together. Eight Days was cancelled along with The Getaway, and the main consideration for cancelling the former was because there was a lack of an online component. I don't know what that says about the current state of the industry where a very compelling and engaging game gets cancelled despite being far along only because there's no online component to it. It's very disappointing that Eight Days was cancelled and still hurts to this day. 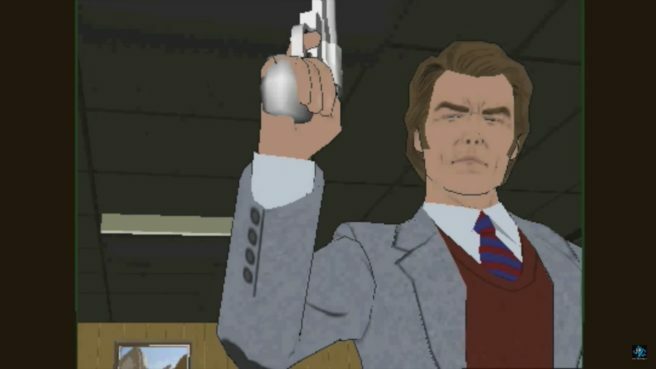 It recently came to light that along with the Dirty Harry game that The Collective was working on for the PlayStation 3 and Xbox 360, developer Sensor Sweep was working on a port of that game for the Wii and Nintendo DS. Unlike the HD console versions, the Wii and DS versions would have offered a very pleasant-to-the-eyes cel-shaded look. 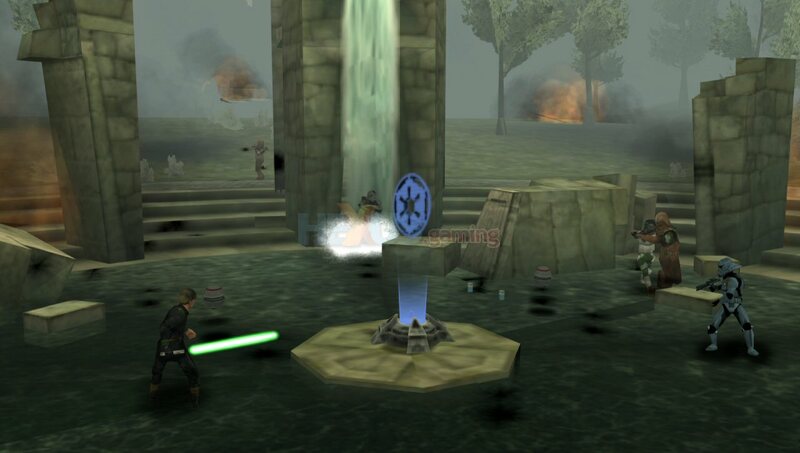 However, Sensor Sweep was not cut out for console development, having only worked on handheld titles in the past. Thus, the SD versions, along with the HD versions, would all eventually be cancelled by publisher Warner Bros. Forgive me for this joke ahead of time, but I guess Warner Bros. didn't feel lucky, punk. This next game hurts a bunch because it was essentially cancelled twice. 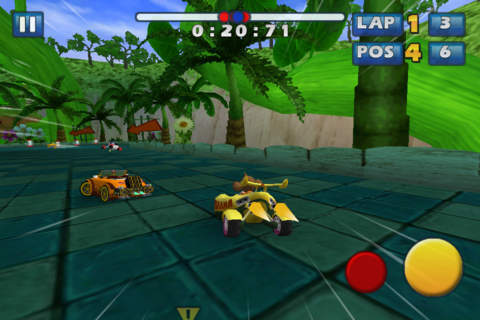 Sabreman Stampede's original form was the planned GameCube game Donkey Kong Racing. However, as we all know, Microsoft wound up purchasing the developer Rare when the founders of the company let go of their shares and Nintendo didn't buy them. 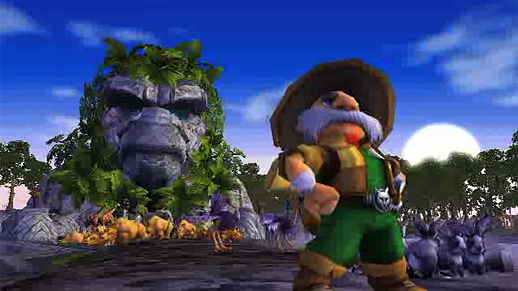 Thus, Donkey Kong Racing became a cancelled game, but Rare would still use some ideas from that title towards a racer starring their old school character Sabreman, an old explorer with a killer 'stache. However, like many projects and concepts from Rare after being bought by Microsoft, Sabreman Stampede would end up being yet another cancelled game, unfortunately. Maybe after Sea of Thieves or some time in the future Rare will return to this concept. Originally planned for an early 2010 release, the planned digital download for WiiWare, Xbox Live Arcade, and the PlayStation Store, Bonk: Age of Extinction, was being developed by Texas-based Pi Studios and was to be published by Hudson. 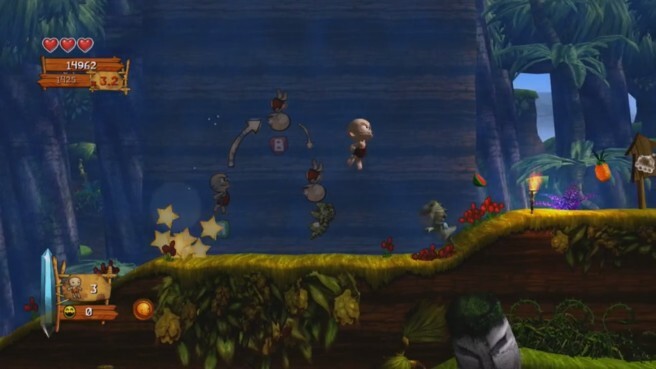 The familiar hard-headed caveman Bonk would move around 2D worlds with 3D models, using his head (literally) to smash prehistoric foes. Offering different, new power-ups such as the ability to shoot fireballs, this revival of Bonk seemed to have everything going for it. That was until Hudson pulled the plug on the project, leaving many a-Bonk and 2D platforming fan seriously let down. There's a cruel irony in the subtitle of this game, as Bonk is now an extinct franchise. Star Fox Zero finally launches this Friday after seeing a delay over the holiday season. This launch trailer shows both gameplay from Star Fox Zero and its accompanying game Star Fox Guard. Both titles use the Wii U GamePad in innovative ways. Here's hoping both games are worthy of the Star Fox name. Time for a new Better Late Than Never review, a review for a game that has been out for a long while, but not old enough to be a retro review. 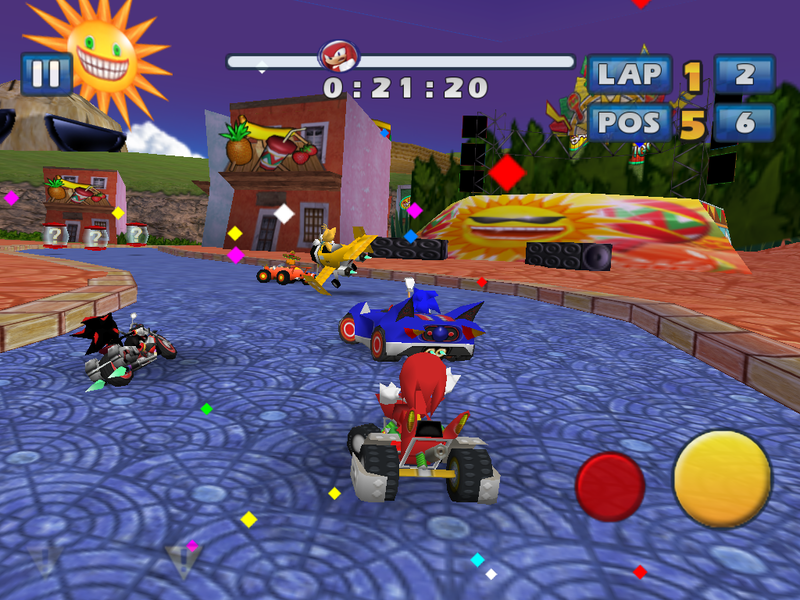 It's for a mobile version of a kart racer I absolutely adore, Sonic & Sega All-Stars Racing. How does it handle on iOS and Android devices? Let's find out together (even though I wrote the review and already know the answer). Why did the hedgehog drive a car? It's not a riddle. Really I don't know why. One of my favorite mascot kart racers of all time is Sonic & Sega All-Stars Racing, which released on last generation consoles and even the Nintendo DS. This obviously made me want to experience the mobile version of the game, as my fan fever for the racing series is as high as ever. While the mobile versions of Sonic & Sega All-Stars Racing has more in common with the DS version than the console versions, the game is overall a pleasant kart racer for iOS and Android device owners to entertain themselves with. 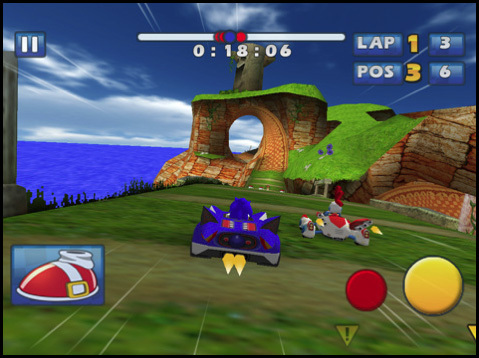 Sonic & Sega All-Stars Racing offers multiple modes for its relatively low price. The Grand Prix offers four cups and three difficulties that have to be unlocked. 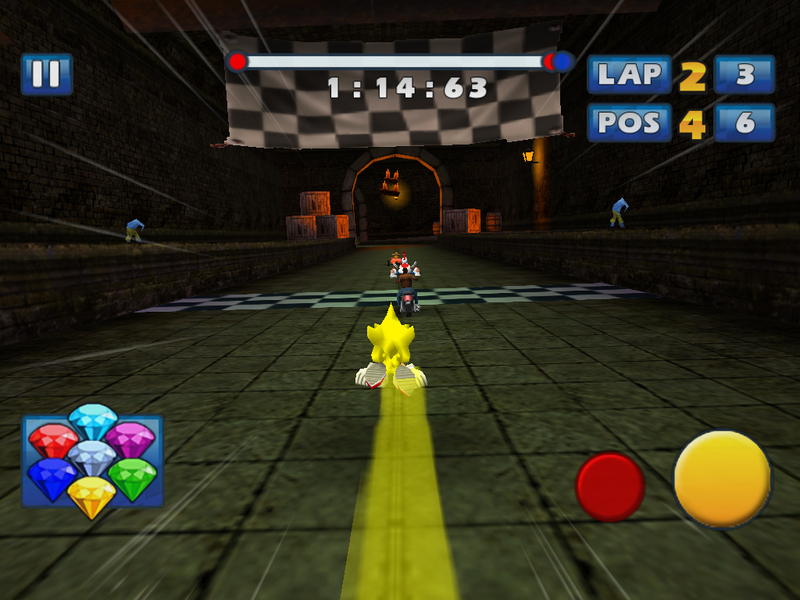 Thus, you start at the Chao Cup on the easy difficulty, and once that is completed, the next cup is available for you to play. The graphics of this game are a compromise between the Nintendo DS and home console versions. One really annoying part of Sonic & Sega All-Stars Racing is its highly frustrating competitor AI, especially in later difficulties such as normal. The AI loves attacking you with homing missiles, and it seems like it happens so much that you can seldom get a good lead going because of this artificial means of difficulty. It makes races closer than they should be, and sometimes you'll be cursing the game and the AI because of how seemingly cheap it is. Thankfully, clearing all of the difficulties and cups in the Grand Prix mode isn't necessary to get all of the achievements of the game, if you're into such a thing. 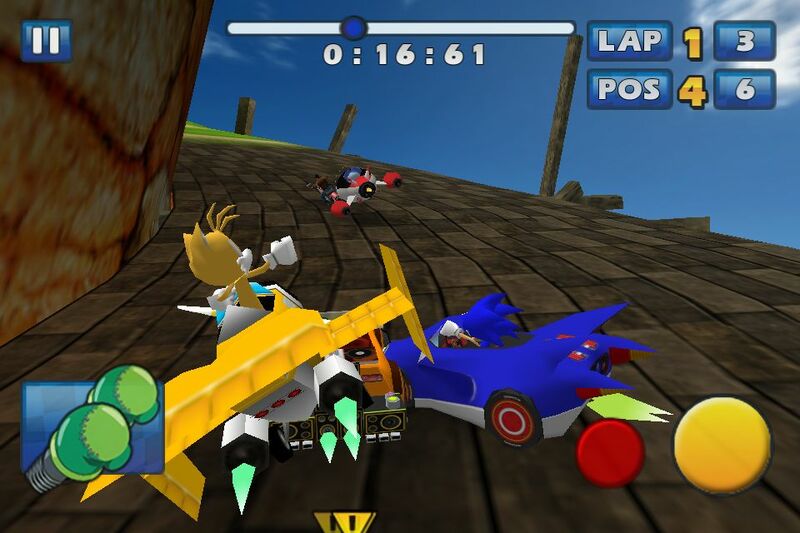 The AI is highly aggressive in Sonic & Sega All-Stars Racing's mobile versions... and highly annoying. Another mode offered in Sonic & Sega All-Stars Racing is the Mission mode. This mode puts you in different scenarios with the task of earning up to ten stars based on how you do. For instance, you might have to drive through as many gates as you can in an arena before time runs out, or play as Sonic, carefully aiming and shooting at creatures resting on the track, hoping to reach the goal in a set amount of time. The missions are quite fun and add some nice twists to the otherwise standard racing formula. The Super Monkey Ball tracks require the most technique with their many sharp turns. Sonic & Sega All-Stars Racing on iPhone, iPad, and Android devices uses two methods of control. The first is tilting your smartphone and tablet to steer. The other is a virtual analog stick to drive about and navigate the game's many twists and turns. Either works well, though you get more precision with the virtual analog stick than you do with tilt controls, which feel a little loose. Item use and drifting are done by pressing buttons on the touch screen. There are three stages of drifting, and drifting longer around a turn or corner results in a bigger boost once you let go of the drift button. Just be careful to not crash into a wall while drifting, or the effects of your boost will be negated. Sega Miles is the currency of Sonic & Sega All-Stars Racing, earned from participating in races, grand prix events, and missions. You use this currency to purchase in-game items such as new characters and race tracks for use in Single Race and Time Trial modes. 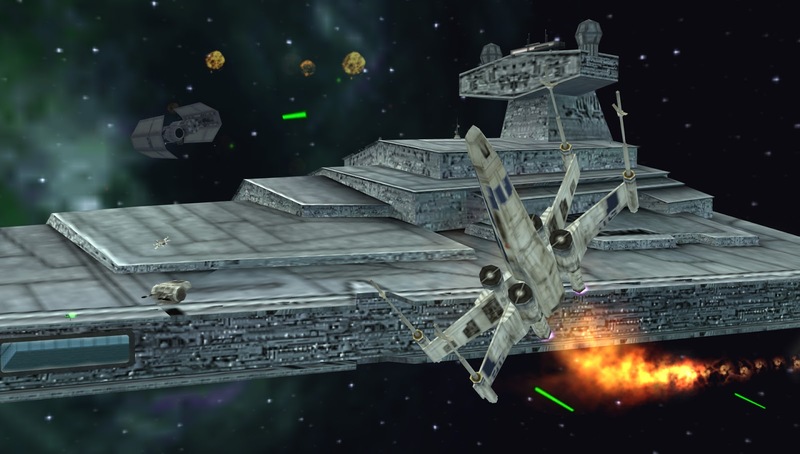 Compared to the console versions of the game, the prices are considerably higher, and that is probably as an incentive to get players to use real world money to buy Sega Miles. While this isn't necessary at all, it can be quite a grind to earn enough Miles to purchase everything the game has to offer. Unlock new racers with the use of Sega Miles, the currency of Sonic & Sega All-Stars Racing. Speaking of the tracks, there are sixteen from various Sega series, including Sonic the Hedgehog, Samba de Amigo, Jet Set Radio, Billy Hatcher, Super Monkey Ball, and The House of the Dead. 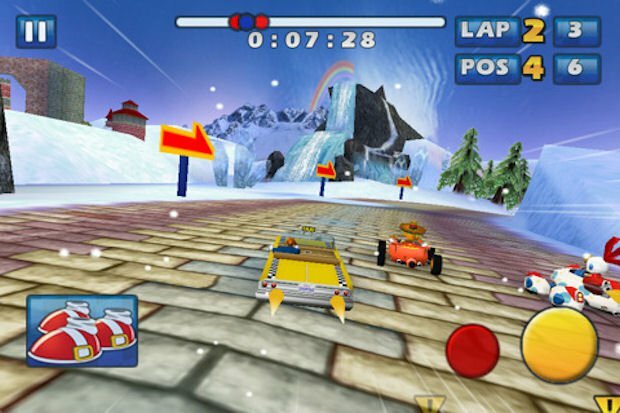 A good number of tracks are taken directly from the home console versions, but the majority of tracks are specifically made for this mobile version. Some feature shortcuts, but this is rare unfortunately. Otherwise you're just speeding around linear tracks with very little to enjoy. Use items like these boost-granting speed shoes to gain a slight edge over your tough opponents. In the realm of multiplayer, what is offered is a bit limited. There is online play, but it's difficult to find any opponents, obviously due to how old this game is by now. 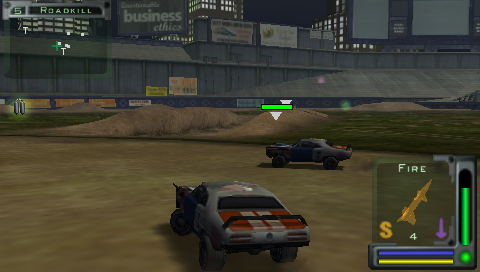 There is also local multiplayer for multiple owners of iOS or Android devices to race each other. Each racer has a chance for an all-star ability if they get too far behind the competition. Sonic & Sega All-Stars Racing isn't that much of a looker, using a lot more simplistic models than I would have expected for an iOS and Android game. The tracks and environments aren't too shabby texture-wise, and the draw distance is really good. It all runs at a firm frame-rate, too. Sound-wise you get all the same voice clips from the console versions and you get track music from other franchise games. The only difference here is that you cannot choose what song is played on a given track. This is because only one song is played per track. A disappointment, but understandable for this lesser version of Sonic & Sega All-Stars Racing. If you don't mind the infuriating AI or the need to grind for Sega Miles to unlock content, what you'll get is a very capable kart racer on mobile devices that plays better than it looks. The online may be a ghost town, but the single player content you can enjoy is pretty loaded with things to do, whether it be the Grand Prix events, Mission mode, or the Time Trials. While nowhere near the caliber of its console bigger brother, Sonic & Sega All-Stars Racing on mobile is a nice port that offers a good deal of fun. Most of you are probably still sleeping as this edition of SuperPhillip Central's Favorite VGMs sneaks onto the site. No worries, though. It's still here now that you're awake! 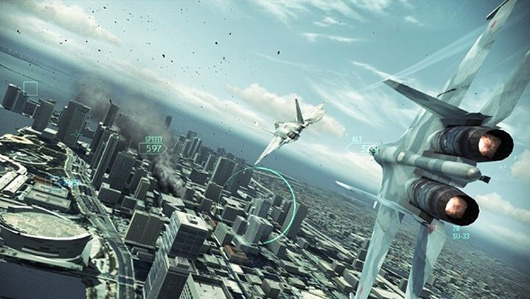 This week we start things off sky high with the credits theme from Ace Combat: Assault Horizon Legacy. Then, we saunter through the overworld of Final Fantasy Crystal Chronicles: The Crystal Bearers. 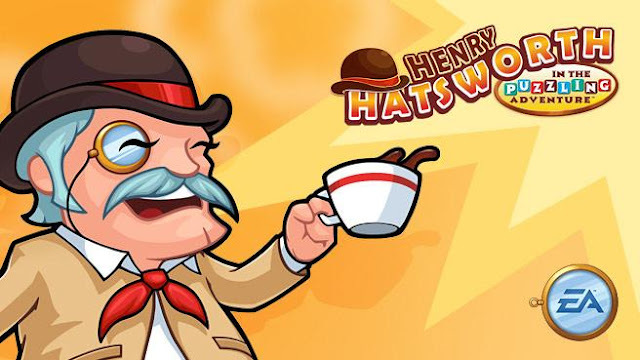 Next up, we drink some delightful tea with a fine gentleman in Henry Hatsworth in the Puzzling Adventure. Finally, we wrap up with Sonic the Hedgehog's first 3D outing in Sonic Adventure, and travel to the Genesis era with Rocket Knight Adventures. If you crave even more VGM goodness for your week, check out the VGM Database. Every VGM ever listed is there for your eyes and ears to enjoy! A gorgeous vocal song concludes the sensational Ace Combat: Assault Horizon Legacy for the Nintendo 3DS. 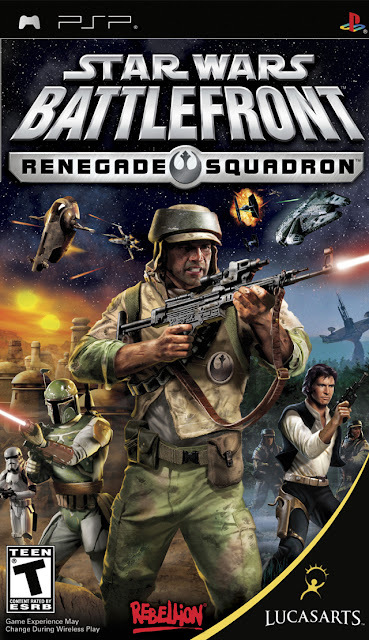 Don't confuse this game for the lackluster console Assault Horizon game. It merely shares the name in the west. The soundtrack is absolutely magnificent, and this theme, Like a Phoenix Rising caps off a brilliant sky-flying epic. Final Fantasy Crystal Chronicles: The Crystal Bearers isn't just an underrated Final Fantasy, but it has a fantastic soundtrack to go along with the fun adventure. This theme is great for exploring the sprawling countryside, finding treasure, and taking in the sights. The Crystal Bearers might not be a traditional Final Fantasy, but don't sleep on this Wii treasure. Who would have expected a creative retail release for the Nintendo DS of all places from a Western publisher like EA? Certainly not me, but I truly thank the gigantic games publisher for releasing this game. Henry Hatsworth is a fine gentleman, and his game is an outstanding, if not quite difficult, 2D platformer with a stupendous soundtrack as evident by this joyful theme. The Blur Blur celebrates his 25th anniversary this year, and in two weeks SuperPhillip Central's Favorite VGMs will host a special themed edition featuring Sonic and pals. To get a tiny taste of that edition in two weeks, here's a rockin' song from Sonic Adventure, a game that brought Sonic and friends (and foes) into the third dimension to conflicting degrees of success. 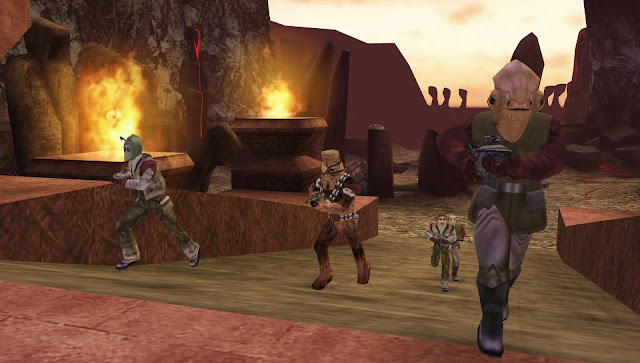 Red Hot Skull plays during the second portion of the Red Mountain level, taking place deep inside a volcano. 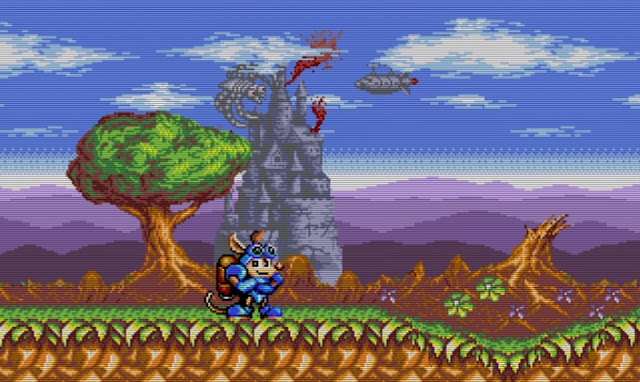 Let's conclude this early morning edition of SuperPhillip Central's Favorite VGMs with a retro classic for the Sega Genesis, Rocket Knight Adventures. This heroic march of a theme plays in the very first level of the game. The franchise saw a resurgence last generation with an Xbox Live Arcade and PlayStation Store release simply titled Rocket Knight. Judging by the demo, the game was something of a good quality. It's Sunday night here at SuperPhillip Central, and my weekend was spent working on my game (I moonlight as a game developer) and playing some games, too. One of these titles was a game in my PSP backlog, Twisted Metal: Head-On, my first foray into the franchise. For those that don't get the review tagline, here's a commercial to get you up to speed. Head-On: Apply directly to the forehead? Twisted Metal was a series I had rested on for a long time. There was something about the grim, dark, and edgy setting that just didn't appeal to me. However, when I had the chance to pick up the PSP installment of the series, Twisted Metal: Head-On, I jumped on it, as the game was incredibly inexpensive. Though the online servers are long gone, this first introduction to the Twisted Metal series for me has me already scouring eBay for other games with the Twisted Metal. Head-On was just that enjoyable. See why with my review. 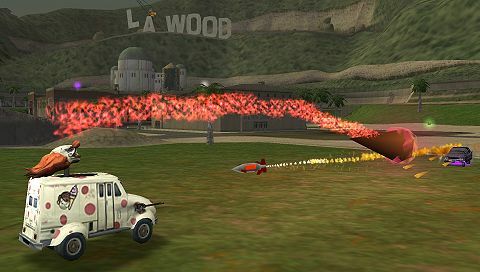 Doing some research on the Twisted Metal franchise, I've learned that the main theme of each game has one of a wide cast of characters each with their own motivations for joining the Twisted Metal competition, a destruction derby of doom where opponents blast one another with high powered weaponry until there's one vehicle left remaining. A man named Calypso runs the competition, and he gives the winner of every year's Twisted Metal anything they wish for. However, as all of the endings of each participant show, these wishes are granted in a monkey paw style way. For instance, to spoil one of the dozen or so character endings, one character wishes for Calypso to bring back her sister. Calypso agrees, but the sister is brought back as a reanimated corpse, which horrifies the other sister. 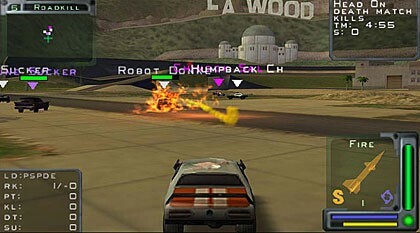 The main mode of Twisted Metal: Head-On is the story mode. This pits your chosen character (each with their own vehicle stats like handling and armor) through eleven levels of destruction derby delight, aiming to destroy your opponents before your three lives run out. Sprinkled throughout the traditional levels are three boss encounters that shake things up considerably. 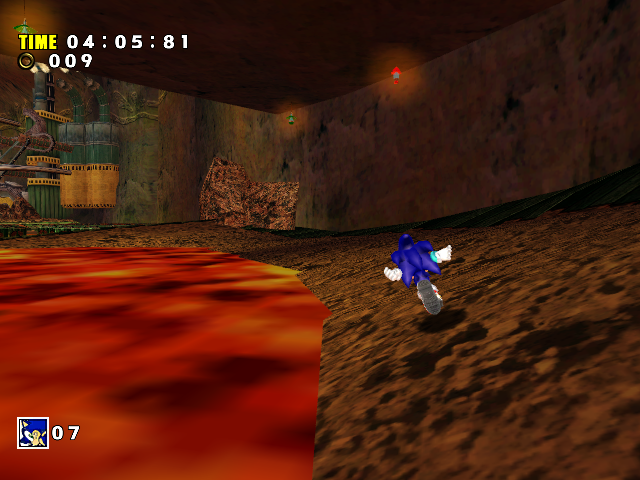 Levels in Head-On are sprawling environments peppered with hidden areas, usually found by destroying a destructible wall. In this globe-trotting competition, you and your competitors will be blasting one another from Greece to Roman Ruins, the ancient pyramids of Egypt to sky high Tokyo rooftops. Each level aside from boss stages hide one secret teleporter that takes you to a bonus mini-game. 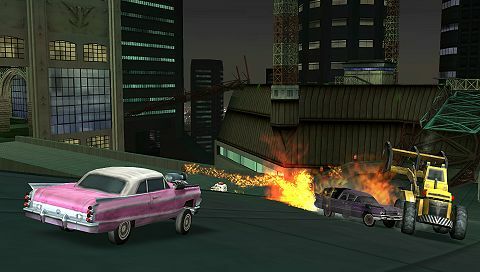 These mini-games house a multitude of varying challenge types like ramming into a bunch of taxis to destroy them, a platforming obstacle course where careful use of your vehicle's jumping ability is required, and a two-lap affair where you drive in oncoming traffic, needing to avoid passing cars in order to stay alive. 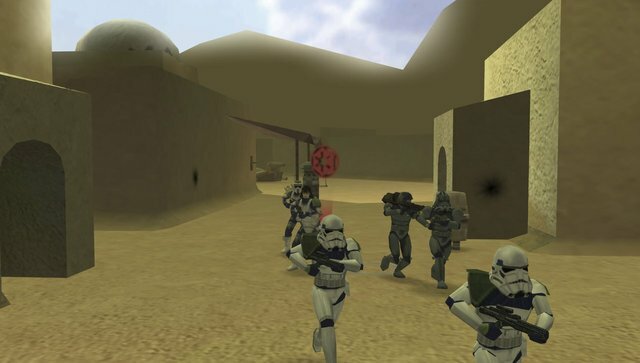 The catch with these mini-games is that in order to unlock content like new characters and deathmatch arenas, you need to beat them under a specific target time. The arenas are full of places to have epic showdowns and have plentiful hidden places. As stated, Twisted Metal is a competition where you man a vehicle and aim to destroy every other competitor before they can destroy you. You do this by driving around expansive arenas, picking up weapons that lay about the environments, and shooting them at foes. There are a great variety of , weapons, such as homing missiles, napalm bombs that are launched in an arc to land on top of foes with their blast radius, and ricocheting discs that bounce off walls, to name a few. Each item you pick up has a limited amount of ammo, so you'll need to constantly scrounge around each arena to get more to use on foes. Health pick-ups are important to remember the locations of in order to heal yourself when you take a lot of damage. All of these sub-weapons are used by pressing the L button while you can whittle away a competitor's vehicle with the R button's machine gun, which every vehicle has. Nothing like glorious destruction to help wind down one's Sunday evening! 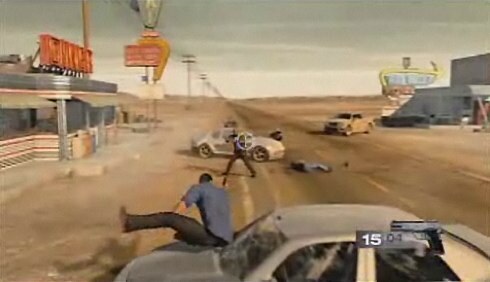 Depending on your character, each vehicle has a special move that is exclusive to that vehicle. For instance, the Twister conveniently enough unleashes a tornado that consumes all nearby racers, while the Roadkill can launch a powerful boomerang that returns to its users, as boomerangs tend to do. 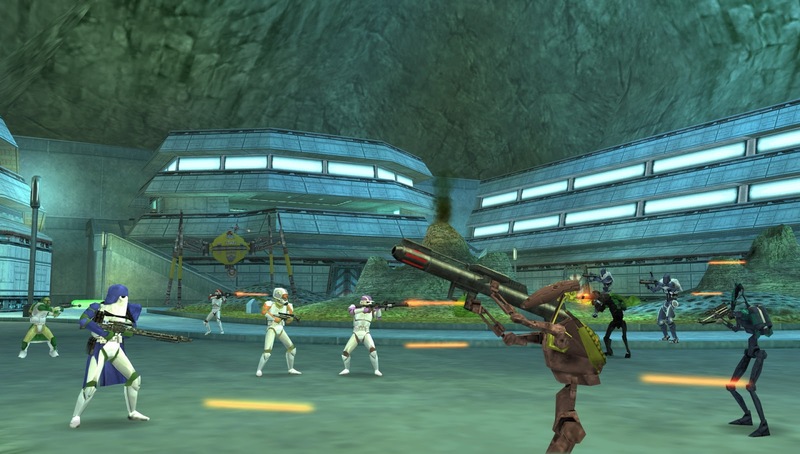 Unlike regular sub-weapons, special weapons regenerate over a short period of time automatically. Sweet Tooth unleashes his special weapon, a deadly scoop of ice cream. A lot of game series from the original PlayStation and PlayStation 2 don't hold up as well control-wise when they're placed on the PSP. This is because the PSP lacks a second set of shoulder buttons and most importantly a second analog stick (or in this case, a second nub). However, the Twisted Metal series doesn't suffer like so many other franchises given a portable entry. Driving the massive number of vehicles in Twisted Metal: Head-On feels and plays great. You use either the d-pad or the analog nub to move and accelerate, holding up to drive forward, back to go in reverse. Double taps of the X button results in your vehicle jumping, while a double tap of the Square button performs a nitro boost for getting away from problematic predicaments. 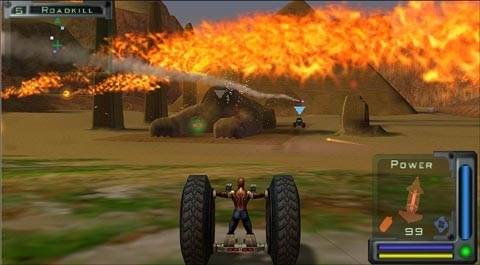 I never had any trouble with the controls of Twisted Metal on PSP, and I was initially worried that I would because of the history of other PlayStation franchises moved to the PSP. Early on in my review I mentioned how the online servers are no longer up for Head-On. However, if you have friends or family with an extra PSP and a copy of the game, you can still play Ad Hoc. However, if you're really looking for the best version of multiplayer for Twisted Metal: Head-On, check out the PlayStation 2 port of the game. It not only has two-player split-screen, but you can play multiplayer without multiple copies of the game (and the need for only one system). It's a much more affordable way to enjoy Head-On. You may not be able to play Head-On's multiplayer online, but Ad Hoc is still available for local matches. However, since Twisted Metal: Head-On's PSP version is so cheap to buy nowadays, it's more than worth getting for its single player modes. 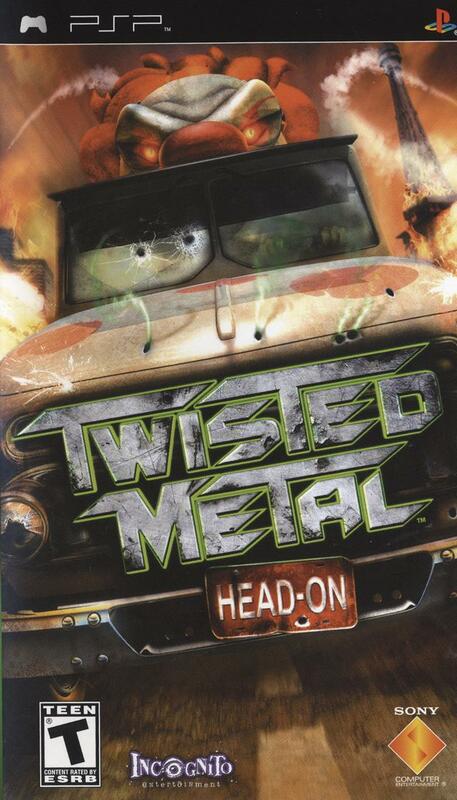 Sure, single player can become repetitive if you want to earn all of the entertaining character endings, and there may be dust on the fenders and a lot of tread on the tires, but overall, Twisted Metal: Head-On was a fantastic introduction to the series for me. I can't wait to get to experience more titles in this destruction derby lover's dream.